Jack Constantine's World's Smallest Woman Show Takes Heat at the Boulder County Fair were it was closed after complaints from fairgoers. 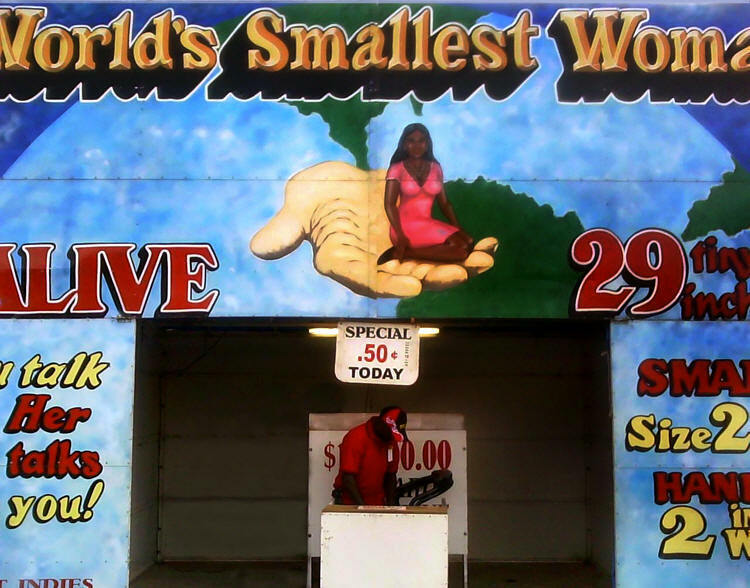 The Boulder County Fair has shut down the "Little Liz, the World's Smallest Woman" sideshow at the carnival after two parents complained to county authorities. The attraction, advertising the chance to see and photograph a 29-inch-tall woman from Haiti, was closed Thursday evening. The first complaint came in Thursday afternoon. "There was kind of an 'ick factor' to it," said Carrie Haverfield of the Boulder County Commissioners' Office, who took that call. "When I talked to our open space director and one of our county attorneys about it, we had the gut check of 'This is not the sort of use we want to encourage.' ... We just didn't feel it was appropriate to a family show." Though the county owns the fairgrounds, the county commissioners' office has no direct authority over the fair, which is run by the Boulder County Fair Board. But when county officials asked to close the event, the fair board agreed. "The disadvantage to this is now the woman is out of work and unable to pay any medical or living expenses for those three days," said fair coordinator Laura Boldt. "I guess we didn't see it as a big deal," Boldt said of the exhibit. "But the carnival was willing to work with us." 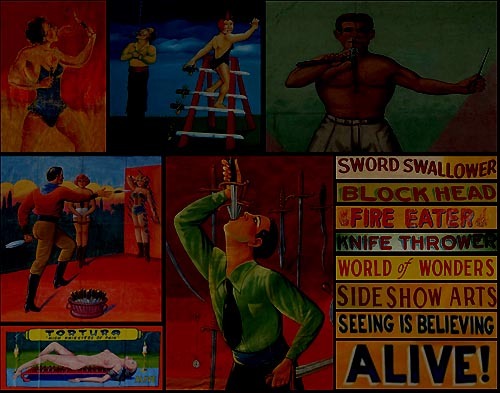 Sideshows — including not just "oddities" but also sword swallowers, fire eaters and other attractions — used to be a staple of traveling carnivals but have largely been replaced by rides as tastes changed and a number of areas made "freak shows" illegal. A similar 29-inch-tall-woman exhibit featuring "Tiny Tina" was evicted by the New Mexico State Fair in 2008, with fair officials calling the act exploitation. She was allowed to return to the event in 2009 after she wrote fair officials to say she didn't consider herself exploited. The carnival at the Boulder County Fair is owned and run by Crabtree Amusements. Owner Pat Crabtree said "Little Liz" and her husband (who translates for her) play about 20 events a year with his carnival as contractors, spending the winter in Haiti. "Her sitting on a chair for pictures isn't any different than a guy dressed like Santa Claus sitting here for pictures," Crabtree said. "To me, it adds something to life, it's good for them (Liz and her husband), and it doesn't hurt anyone." He also argued that the complaint was costing Little Liz a living for a few days, and asked if the person who made the complaint planned to buy her dinner. "I wish there were more sideshows," Crabtree said. "When people come back from a carnival, they should be able to say, 'I've never seen anything like that anywhere else.'" Haverfield called the situation a no-win. "Obviously, our goal is not to have anybody lose their source of income," she said. But at the same time, she said, the fair's events needed to reflect what county residents considered appropriate. "In both cases, they were parents who were with their children," Haverfield said. "They both said their children were very disturbed by it. That's not the type of activity we want to see happening."